Simon Faithfull (b. 1966, Ipsden, Oxfordshire) lives and works from London and Berlin. He attended Central St Martins School of Art, London from 1985-1989, where he received his BA (First Class), followed by Reading University, from 1993-1996, where he received his MA Fine Art. Faithfull’s recent solo and two person shows include Reef, Le Musée des Beaux-Arts, Calais (2015); Reef, Fabrica, Brighton (2014); Wanderings, ICIA, Bath (2013); Simon Faithfull: An Expanding Atlas of Subjectivity, ArtConnexion, Lille (2012); Going Nowhere - Simon Faithfull, Parker's Box, New York (2011); An Expanding Atlas of Subjectivity, National Museum (Project Space), Berlin (2011); Voyages Extraordinaires - (Simon Faithfull/Christoph Keller), Altkirch, CRAC Alsace (2010), and Recent Findings - Simon Faithfull, Harris Museum, Preston (2010). His recent group exhibitions include Things - project via Hoodwink, Morrisons supermarket, Royal Tunbridge Well, Kent (2014); The Vault, SPACES Gallery, Cleveland (2014); 7 Raumthesen - Curated by Susanne Neubauer, ROTWAND, Zürich (2014); Perduti nel Paesaggio, Mart, Rovereto (2014); Nouvelles Vagues - Le Principe Galápagos, Palais de Tokyo, Paris (2013); Re-Viewing the Landscape: A Contemporary Response, Compton Verney (2013); Verstand und Gefühl, Kunstverein Springhornhof, Neuenkirchen (2013); Ulysses, l’Autre Mer, FRAC Bretagne, Rennes (2013); Witnessing the Wilderness, Wimbledon Space, London (2013); Des Mondes Possibles, FRAC Franche-Comté (2013); LA – BERLIN, &model, Leeds (2013); Fake Moon, In Between Time Festival, Bristol (2013), and A Future Pump House: - Ideas, Thoughts and Plans, Pump House Gallery, London (2013). Faithfull’s work is held in public collections at Centre Pompidou, Paris; V22 Collection, London; and Government Art Collection, England, amongst others. 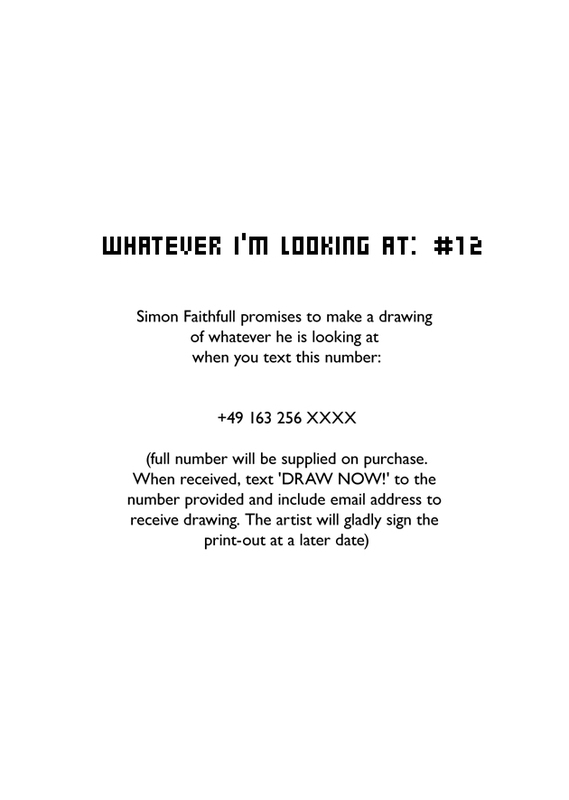 For the successful bidder of Simon Faithfull’s work, they are invited to call the artist on his mobile and in exchange he will draw what he sees directly in front of him at that moment. As an artist who is often travelling to far flung places this presents an element of surprise and chance for the purchaser of his work.